LeTAO SG & All Nippon Airways offer you the chance to win a pair of return tickets between Singapore and Hokkaido (Sapporo – Otaru). 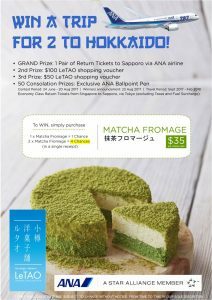 Simply purchase our Matcha Fromage cheesecake (S$35) to stand a chance to win. Hurry down to ION Orchard #B1-K7 and buy 1 today!